PhotoPad Pro Edition for Mac OS X. Retouch photos quickly and easily and edit and apply effects to photos and other images. 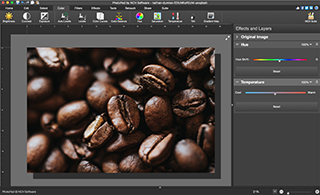 Crop, rotate, resize and add effects like sepia tones, greyscale, and red eye reduction as well as adjusting the hue, saturation, brightness, contrast and more. PhotoPad Pro Edition for Mac Features: * Fast and easy. * Load gif, jpg, psd, png, bmp picture formats and more. * Preview effects before applying. * Easily delete any applied effect without removing other effects. * PhotoPad can be added to your right click menu for easy access. About NCH Software: NCH Software offers more than 80 easy-to-use software applications for audio, video, business, dictation and other software utilities for Windows, Mac and mobile devices. Individual programs fulfill specific needs and solidly integrate with related products, improving productivity for small businesses and consumers alike. By offering such a wide breadth of software applications at affordable prices, NCH Software is where users turn for reliable software applications for any need. This approach generates over seven million unique visitors and three million software downloads per month. This site does not contain serial number, crack, keygen PhotoPad Pro Edition for Mac serial number : serial number is the simplest type of crack. A serial number(cdkey,product key,etc) is register the program as you may already know. a crack or keygen may contain harmful software. If you cannot find the exact version you want, just give it a try. for more information read .nfo/.txt/.diz file include in zipped file.